Borderline compelling in a minor trainwreck sort of way, Bloodmatch keeps you watching because you’re never sure what it’s up to. That’s not to say that it’s some sort of groundbreaking film or ingeniously plotted or anything like that. It’s straight forward enough – though to be honest I’m not sure I ever really grasped the finer points of the story. It’s just that what is going on is so unpleasant, you’re hoping that they’ll somehow figure out a way to make it all palatable to the viewer. You probably won’t be surprised that they never do. You’ll probably be even less surprised that the movie is directed by Albert Pyun. Pyun is routinely vilified for all his supposedly bad movies which by itself is no big deal, but he also seems to be singled out as some sort of poster child for incompetent garbage filmmaking. Maybe it’s because I’m used to trawling the depths of Italian exploitation fare directed by the likes of Joe D’Amato, Fabrizio D’Angelis, and Pierluigi Ciriaci, but I don’t really see why so much scorn is heaped on Pyun other than he’s fairly prolific. He makes a lot movies and a lot of them aren’t very good, but then again some of them are fine for what they are. The Sword and the Sorcerer and Cyborg delivered low brow entertainment without leaving me feeling raped and abused. Heck, I even liked Captain America! So this review is not going to complain that we’re suffering through just another Pyun cinema misfire. It will complain about just about everything else though. What was most amazing about this movie was how it took that most basic of all kickboxing movie themes, the “revenge for dead brother/friend/manager with a mullet” story, and turned it into some sluggish murder mystery, the bulk of which took place in an empty arena. That by itself however would merely make this another cruddy kickboxing movie I barely made it through. What elevated it to the extent that I frankly think the movie created its own genre, the kickboxing murder mystery psychological thriller, was that our hero was a complete psychopath! Even worse, he was prone to unending monologues that made you want to give yourself a roundhouse kick to the balls! After Brick beats a guy senseless in the desert, stakes him to the ground and stabs him, he gets some names of those that were somehow involved with railroading his brother out of the fight game by implicating Wood in a fight-fixing scheme. He uses a variety of tactics to capture these four people, including kidnapping the daughter of one guy, threatening to chop her up and hang her pieces on hooks. He has a gal pal named Max pitching in and screwing a guy before knocking him out. 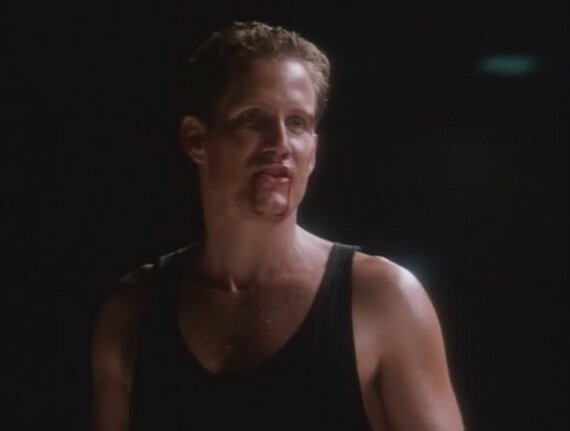 Brick also captures Connie, Wood’s money-grubbing ex-girlfriend who ran Wood’s kickboxing organization, by killing her boyfriend right in front of her! These unfortunate four are hauled to an empty fight arena in Vegas where Brick spends hours reading them the riot act about what they did, what they know, how they ruined Wood’s life, and anything else that seemed to pop into Brick’s deranged mind. Every so often, he would have Max bring one of these guys down to the ring and fight them to the death! This was somehow supposed to elicit information from them. It didn’t really work too well and resulted in lots of scenes where Brick just beats the crap out of these guys to the extent that he’s kneeing them in the face like ten straight times, kicking them when they’re half-dead, stomping them and even running their head across the ring ropes! At one point he breaks Benny “The Jet” Urquidez’s back after telling him he chopped his daughter up! Is it wrong that I was really hoping that Brick would get killed by one of these guys? But wait! All is not as it seems! Whew! I knew there was a good reason for all this nauseating mental and physical torture! It turns out that Brick Bardo is actually Wood Wilson! Wood never died! He was left for dead, but the doctors fixed him with all new parts including a new face! And his henchwoman Max? That was really Wood’s nurse! She loves him and is all for this little killing spree of his – it’s the only way he can put the past behind him! 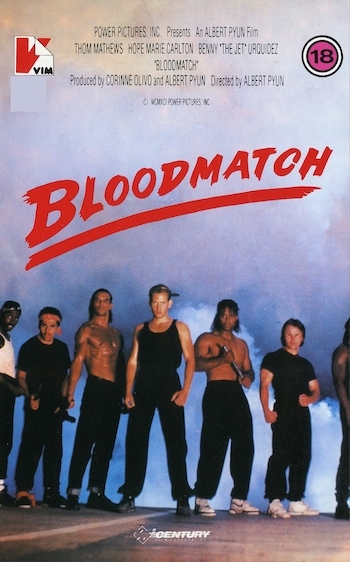 Further turning the kickboxing movie genre on its head, Bloodmatch finishes with a fight between Connie and Brick/Wood that she wins! Connie had already stabbed Max to death which just goes to show that you have to fight psychos with psychos. So I’m left with a movie about a guy trying to get revenge on those who did him wrong, but his revenge is so beyond the pale, you root for the bad guys. And then, he doesn’t even get total revenge and Connie is somehow transformed into the hero at the end when she defeats him and decides that she will take care of Benny’s kids! But she was a cold-hearted greedy skank who didn’t care that Brick/Wood killed her boyfriend! And what exactly was the point of Wood’s bogus identity? What benefit was there pretending to be Brick? It was totally unnecessary and seemed to exist soley to give the movie a little plot twist. Too strange to be called a truly terrible kickboxing movie like Kick of Death, Bloodmatch is still too full of lengthy soliloquies and unlikable characters to really be a great strange kickboxing movie like Night Of The Kickfighters. Nothing more than a curiosity that’s unsuccessful at whatever it was trying to accomplish.